Visit 11 was an improvement on visit 10 but still below our best catch from visit 9. On our previous 10 visits this season we have only managed to catch 2 adult female Chaffinch, today we managed to catch 5 juveniles, a few singing males earlier on in the season but unfortunately never managed to catch any yet, with only one visit left after this it's looking like we might not. Another 7 new juvenile Chiffchaff were caught today, this now takes our total to 59 Juveniles caught. It'll be interesting to see our totals after our 12th and final visit of the season takes place. 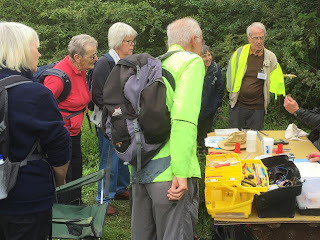 Unknown to us the Midlothian Walking Festival was taken place from Friday 12th - Monday 15th August. One of the walks surprisingly took them around our ringing site, they all seemed very surprised and inquisitive to what we were up to and us with them as we never usually have many folk walking around our site, even though it's a SWT reserve there are very few visitors pass through. After they had completed there walk around the reserve and before walking on to there next destination time was afforded to watch us processing some of the birds that we had caught, a few didn't recognise one of the birds in particular, as it was still in full juvenile plumage it didn't have it's distinct red breast, they never thought it could be a Robin. After thanking us to for an impromptu ringing demonstration they departed to continue there 5.5 mile walk along part of the Pencaitland Railway walk. An unexpected Bird Ringing demo for Midlothian walking festival participants.